Successfully Added 2-Way Car Alarm Security System (Sports Edition) to your Shopping Cart. 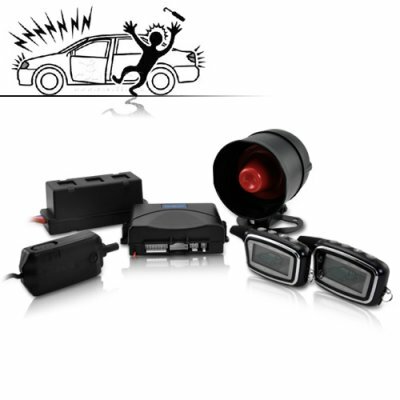 Power up your vehicle protection with the new wholesale priced 2-Way Car Alarm Security System. This sophisticated and effective 2-way Car Security System helps to protect your vehicle and its contents while the screen on the remote controller will let you know exactly what is happening to your car as well as let you instantly issue commands to the system for various security situations. Designed to be used for all common car/van/SUV/4WD trucks, this state-of-the-art 2-Way Car Security Alarm System can effortlessly protect your beloved vehicle from thieves and intruders. The mini remote controller can be easily attached to your keyring or fit inside your pocket. With its intuitively interface, you can monitor the status of the alarm system, turn it on/off, and start or shut down the engine from as far as 3000 ft away. Temperature controlled engine start up: air conditioning the inside so its is nice and cool when you open your car door. Did we mention, this comes with a Low Wholesale Price? Just google "2 way car alarm", and you will find that similar high-tech car security systems are selling for well over $200 USD. We are able to bring you the same quality product but at a fraction of what you would pay for those "named brands" because with Chinavasion you are getting it directly from the China factory source. So if you just bought a new car or own a car that is irresistible to thieves, don't delay, click "Add To Cart" button right now and we will ship out this car security system to you within 24-hours. The CVRE-A53 is available only from the original China Electronics Wholesaler - Chinavasion. What type of vehicles does this 2-way car alarm work with? The 2-way car alarm security system is designed to work with all car models. Please feel free to purchase a sample and make sure it is installed by a professional technician. Have Fun! Does this 2 way car alarm security system work on both manual and automatic transmission vehicles? Yes, it works on both automatic and manual transmission cars. 2-Way Car Alarm is the newest technology in car security system. Instead of only sound the siren or beeping the horn when the alarm is triggered like traditional car alarms, a 2-way car alarm can pass the alarm signal to a remote controller so its owner can take various actions according to the detailed information displayed.